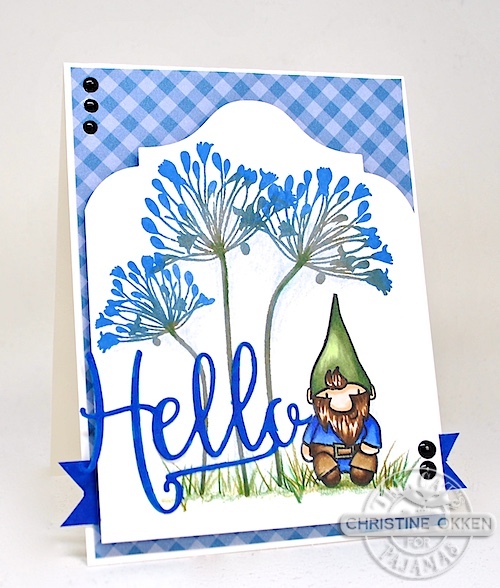 ChristineCreations: How Does Your Garden Grow? Hello! I’m popping in with a cute little design for The Cat’s Pajamas newest challenge, How Does Your Garden Grow? There are a lot of different TCP sets that will work for this challenge, but I chose to go with two of the newest using What’s Up Gnomie? and Big Blooms. This time I used the flowers as intended as Agapanthus and gave them some pretty deep blue colour, fading into the green of the stems. It’s really easy to do using a MISTI. I ink up the tips of the flowers with blue ink first, and then come back with my green ink, re-ink the stamp and stamp the stems. I wanted our sweet little gnome to be hiding under the blossoms, tucked in the grass. I coloured him with Copics, finishing with a little prismacolor pencil, especially to make grass blades. For the top of the main image I used a TCP CutUps die called Fancy Flip, using just the top portion of the die on the top portion of the panel. This gave it a fun and interesting curve. I added the Hello from TCP’s CutUps Die called Hello There. 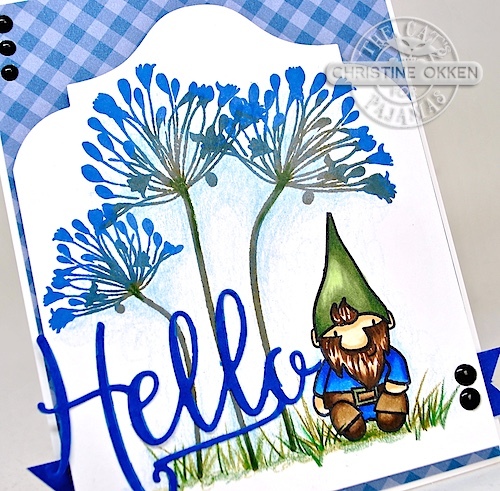 It’s a great little word die because of the great script, and you can alter it with a couple of snips to just say hello, which fit perfectly on the card. Just a note for all my TCP friends and fans out there, I wanted to let you know that I’m going to be taking a break from the Design Team at TCP for the next season to make some space for the demands of my job and those crazy kids of mine. I know the TCP and the Cat Pack will continue to bring you fun and whimsical delights in the mean time. Thanks for all your support for the great things at The Cat’s Pajamas! Don’t forget about the Challenge! Each month a new challenge will be posted on The Cat’s Pajamas blog and our Facebook page. On the day of the next challenge the winner will be chosen from the previous challenge and will receive a Cat Cash Voucher for $50. Christine, this is a delightful card. The blues are so cheery. The gnome is a cute touch. TFS. Tee hee! Tickles my funny bone! Cute and pretty, Christine! Love the vibrant colors Christine. A beautiful design.